Apple may be considering partnering with its China-based supplier Foxconn to purchase a major stake in Toshiba's semiconductor unit. In January, Toshiba officially announced it would seek to sell a portion of its flash memory business, including the SSD business of the Storage & Electronic Device Solutions Division, to a not-yet-named buyer. 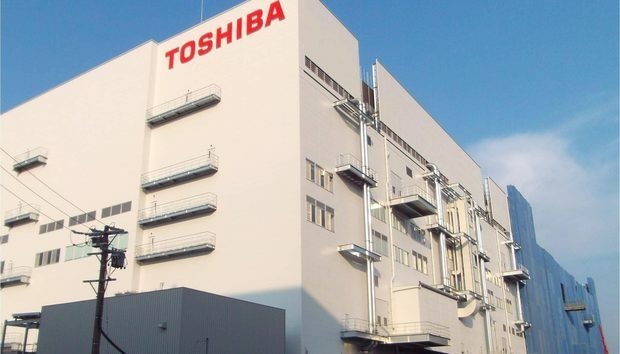 The Nikkei Asian Review has reported that Toshiba may sell a 20% stake in the memory business for between $1.77 billion and $2.65 billion, "while retaining a majority stake and keeping the new company in group earnings." Toshiba's solvency and fundraising ability are presently in doubt because of a $1.9 billion accounting scandal and a huge loss related to the purchase of a U.S. nuclear plant business. The company, which invented NAND flash in the early 1980s, had been considering spinning off its semiconductor operations and selling a partial stake to Western Digital (WD) and others, as it tries to cope with a massive impairment loss in its U.S. nuclear power unit. Neither Toshiba nor WD have confirmed a potential sale, however. Earlier this year, Toshiba took a writedown of $6.56 billion against its struggling U.S. nuclear equipment operations and it's hoping to rebound from that loss with a sale. "Its financial problems were a major drag on the growth of its memory business," Sean Yang, research director of DRAMeXchange, said in an earlier interview. Several potential buyers have been identified in reports, including Apple, according to Bloomberg's news service. Apple is considering investing several billion in Toshiba's memory business, according to the report. "It seems like they are selling the Golden Goose and keeping the money pit," said Jim Handy, an analyst with Objective-Analysis, referring to Toshiba. If Apple were to purchase a stake in Toshiba's semiconductor business, it would be a departure for a company that has historically outsourced most of its parts and labor, Handy said. "Seagate and Western Digital used to believe that vertical integration was necessary in order to compete in the SSD market, although Seagate appears to have changed its tune," Handy said. "A captive source of supply is a good thing to have during a shortage, but can be a millstone during an oversupply." Semiconductor Manufacturing Co., a major supplier to Apple, reportedly said it was not participating in talks after reviewing a possible deal "with interest." According to one report, Western Digital (WD) is none too happy about Toshiba's plans to sell its memory business. WD reportedly sent a letter to Toshiba telling it the proposed sale breaches a joint-venture agreement as part of the FlashAlliance to build flash fabrication plants in Japan, which are operated by Toshiba. WD's SanDisk holds a 49.9% share in the FlashAlliance and a Toshiba has a 50.1% share. Any potential sale by Toshiba might be on hold for now as it deals with WD's concerns. If Toshiba does sell a major stake in its memory business -- or the entire unit -- it would do little to effect the memory market as a whole from the perspective of supply and demand, according to Handy. "From the perspective of national security there are significant concerns that Japan will lose control of an important technology, and that it will be owned by a company from a country that has a difficult history with Japan," Handy said, referring to China and Foxxcon. "From WD's perspective it's really strange, since they have a very good working relationship and understanding with Toshiba, but not necessarily with the buyer. "I like to think of it as your spouse coming in and saying: 'Here's somebody new for you to be married to!' then walking off."